"There is good and there is evil. Right and wrong. Heroes and villains. And if we're blessed with wisdom, then there are glimpses between the cracks of each where light streams through. We wait in silence for these times when sense can be made, when meaningless existence comes into focus, and our purpose presents itself." For centuries, humankind has had a secret. A secret that, if revealed, would change the world as we know it, and shake the very foundation of what it is to be "human." We have been EVOLVING, and that evolution has granted us abilities far beyond our fellow men and women. What would usually be deemed impossible is, in truth, far from it. Teleportation. Flight. Telepathy. Regeneration. Telekinesis. Over time, many organizations formed to try to contain this "secret." Sometimes even those of their own kind sought to silence the DNA Alternates, but none have ever been fully successful. Still, the government continues to try, but this time as they formed another agency, there was a new twist. During a time of world chaos caused by a terror group that called themselves Nemesis, the same group imposed DNA Alternates into the world's governments. America's own president is one of their number, as are leaders in parliaments and communist regimes around the globe. They've done so quietly, taking over the world from the inside while the people watched what was taking place outside their windows. The world took a collective sigh of relief as the leader of the Nemesis terror group was slain, finally putting to rest their fears of another impending attack. But just because Yomin Breise is dead, does it mean Nemesis is no longer a threat? Or did the threat bury itself so deeply, so silently, that now that the show is over, the real threat has begun? There are still two sides to this fight. Which side will you take? "And if we have the strength to be honest, then what we find there, staring back at us, is our own reflection, bearing witness to the duality of life. And each one of us is capable of both the dark and the light, of good and evil, of either, of all. And destiny, while marching ever in our direction, can be rerouted by the choices we make. By the love we hold onto, and the promises we keep." 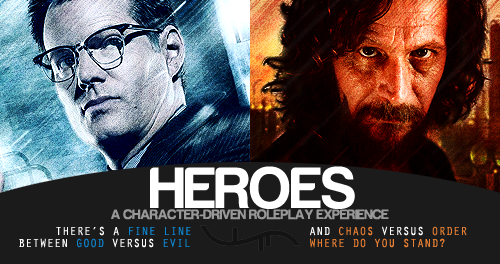 Heroes: The RPG is an active play-by-post role-playing forum that has been successfully running for over SEVEN YEARS! We're open to all levels of writing ability, and knowledge of the show is in no way required to join the game. We're always looking for new members, and it's easy to hop into the game, but with the start of our own unique Volume Seven: Eulogies, it's an especially good time to join!